“This Empty World”, a new series by contemporary artist Nick Brandt is the artist’s first body of work in color and a blazoning exploration of the vulnerability of animals and humans in an era of environmental degradation. Brandt’s vision communicates the urgency of environmental issues with undiluted conviction. By using color for the first time, this work amplifies the immediacy of today’s environmental crisis, departing from the timeless classicism of black and white photography. 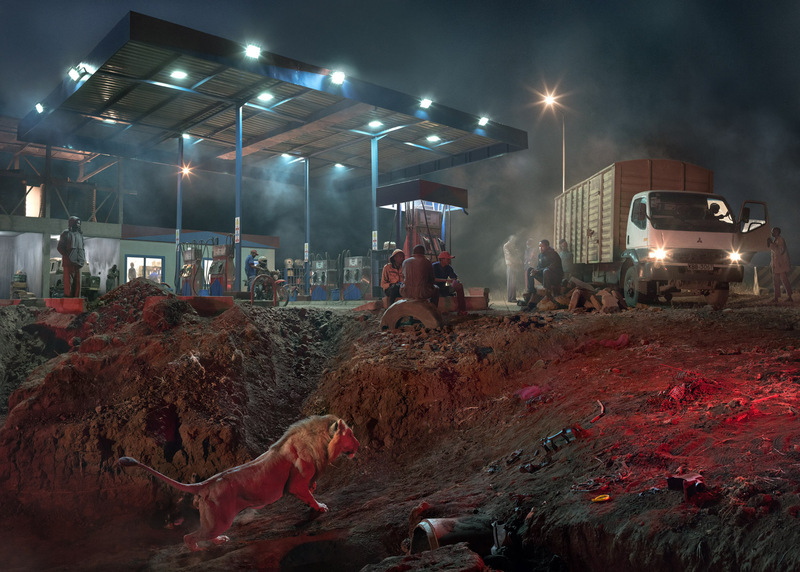 Predominantly nighttime scenes, the series’ most saturated fields of color are the blinding artificial lights that illuminate the dark but also reveal the negative aspects of development, affecting both animals and humans. The images are currently on view at Edwynn Houk Gallery, in New York. The works’ impact, immediate and direct, is informed by a painstakingly deliberate and nuanced process. The series was photographed on Maasai land in Kenya, where the artist has been working as an artist and conservationist for two decades. Each image combines two photographs, captured from the same camera position taken weeks apart: one of elephants, giraffes, lions, and other wild animals roaming their natural habitats, and another of elaborate sets populated by human casts, drawn from local communities. The mise en scène replicate the gas stations, bus stations, and construction sites that have become naturalized elements in every landscape in the world, including East Africa. Brandt’s finished works, composite images of the wild animals and the human-inhabited sets, create startling scenes of the two worlds in direct dialogue. As conscientious as the artist is in constructing these scenes, he is equally deliberate about their footprints, ensuring that all materials are recycled and there is no trace of the project left behind. The works in this series draw on long-standing art historical precedents to articulate their revelation. With compositions inspired by breakthroughs from history painting such as Théodore Géricault’s “The Raft of the Medusa” (1818-19) and chiaroscuro reminiscent of Gustave Doré’s “Divine Comedy” engravings (1861), Brandt’s work continues the artistic tradition of contemporary debate through dramatic metaphor. Meanwhile, the panorama form recalls the elongated canvas, popular amidst 19th-century painters aiming to create immersive landscapes, but rather than contemplate the sublime pastoral or quaint cityscapes, Brandt’s works address the nitty-gritty of urbanization.